I could call that moment a mistake, but I think it probably wasn’t. I probably wasn’t ready for this book at age twenty. While I’m still not much older than I was and certainly not much wiser, I adore this book now in a way I don’t think I could have then. It’s written as a letter to the son of the narrator. 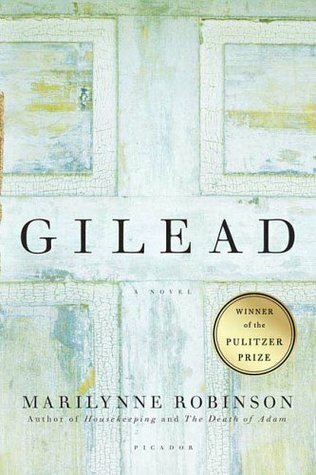 The narrator is an elderly pastor in the small town of Gilead who has married late in life and has a little boy. The pastor’s health is not good, and he knows he won’t be there when his boy reaches adulthood, so he writes him a letter that contains some background of his family history (fascinating), and some lessons learned (deeply insightful), and even the unraveling of a scandal that happens during the writing of the letter. This plot may not draw you, but I’m begging you, read it anyway. It is masterful. I choke up even now when I think of how exactly true these words are, how that is just what the forehead of a baby feels like against my hand. The whole book is a tribute to how achingly beautiful this earthly life is, and how pain can be redeemed. It is written from the firm viewpoint that Heaven and eternity are absolute and God is good and His goodness is here even on this broken earth. Even so, it is not preachy. (It won a Pulitzer, so you know it’s not preachy!) But it is wonderful, and I cannot recommend it highly enough. I’m so thankful that Edie at Life in Grace put it on her reading list for the year, which reminded me that I had always meant to read it. It’s definitely the best book on My Fall Reading List so far. See other favorite books here! Previous post Seize the Nanosecond!